Climate change is happening now and local governments must play a significant role in reducing emissions and helping people cope with the impacts. Austin has existing climate commitments and has made progress in expanding its use of renewable energy, but many challenges remain. 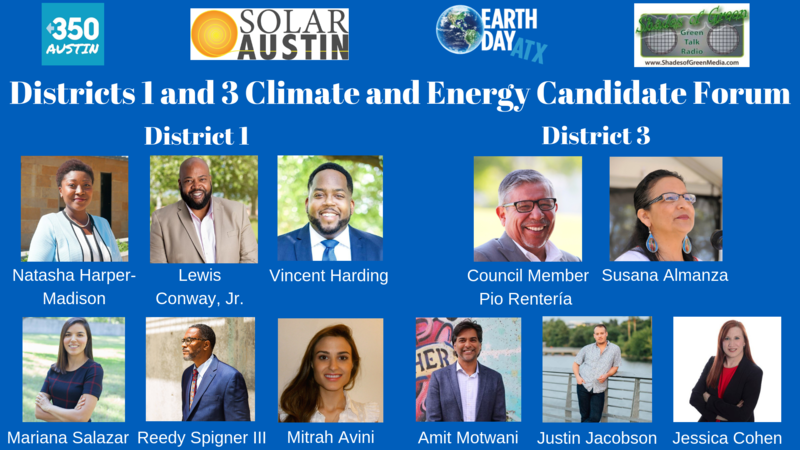 Solar Austin, 350 Austin, Earth Day Austin, and Shades of Green are hosting a forum for mayoral candidates to speak to Austinites about their climate change and energy priorities. Please join us to hear from Natasha Harper-Madison, Mariana Salazar, Lewis Conway Jr., Reedy Spigner III, and Mitrah Avini from district 1 and Council Member Pio Rentería, Justin Jacobson, Susana Almanza, and Amit Motwani from district 3. We will have prepared questions and will accept questions from the audience. The event is FREE, but we do appreciate your RSVP.